Coming Back to Life is one of a kind place. I have never encountered something like this before. This place has a very zen vibe to it, a calm and composed feel. The cafe sprawls across a huge area, with the main cafe just at the entrance. Take the stairs and go down to find a huge seating area that is mostly used as a salon, spiritual workshop and kids area. Nicely furnished with faux grass, it is well maintained and nicely lit. This place is perfect for days when you want to have a little 'me time' and is also great for going on a date. Coming to the food, they have quite a decent fair. Starting with the salads to the appetizers. We also tried their Chinese fare which was pretty decent as well but what really stood out for me was the amazing pesto chicken bruschetta! The pesto and chicken went so well together - it was pretty much the marriage of flavour and texture. It is a definite recommendation which goes perfectly with any beverage of your preference. I would also recommend their range of teas and coolers, it's pretty amazing as well. The choice of music really needs working on. It just does not sync in with the zen vibe of the place. 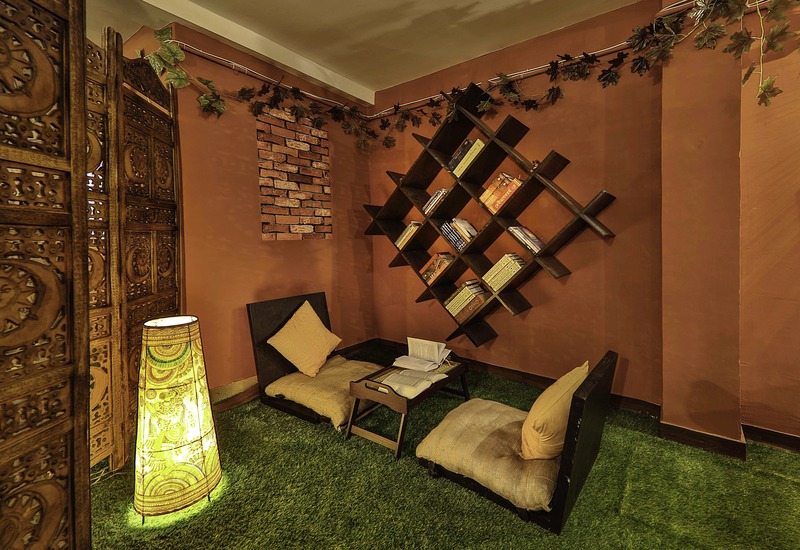 If you are looking for a quaint spot and want to spend some lone time, do check out their little book rack and the cosy corners that is downstairs. Just the perfect place to unwind and read a book with a steaming cup of coffee. As locating this place can be a little tough, so you might want to Uber it there. Quench Your Thirst With Coolers From Lucifer Is Coming Back To Life's Special Summer Menu!